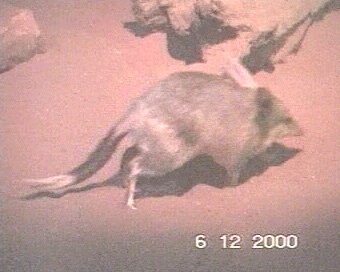 As Bilbies are strictly noctural, these video clips were shot under a red-pink night light. The red has been reduced via software manipulation, but the pictures are still slightly pink. Unfortunately, high quality video clips produce large files, even for only a few seconds video, and large files take up a lot of space on webservers, and take a long time to download. Therefore these video clips are available in both small, 'low quality' and larger 'medium quality' versions. Check out the smaller versions first, and if you like a clip, and you have the time, have a look at the larger version. All files are Microsoft 'Video for Windows' AVI file format. Small clips have an image size of 176 x 144 pixels, large clips are 352 x 288 pixels. A Bilby chews her food while a friend races past. Small clip - 234Kb AVI file. Larger clip - 705KB AVI file. Three Bilbies in the corner. Small clip - 423Kb AVI file. Larger clip - 1798Kb AVI file. 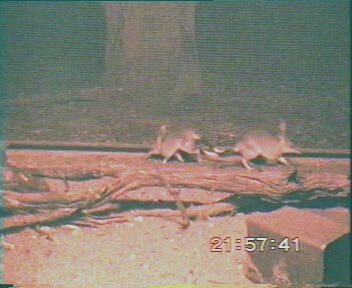 Two Bilbies running away from each other. Small clip - 187Kb AVI file. Larger clip - 336Kb AVI file. 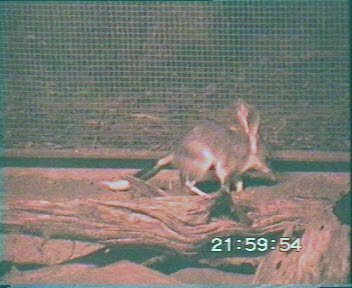 A Bilby runs under the log. Small clip - 382Kb AVI file. Larger clip - 1194KB AVI file. 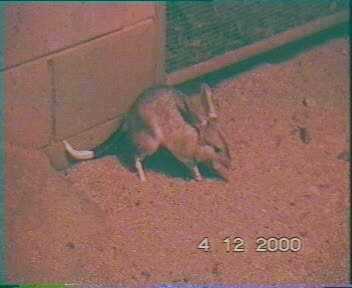 Note: these Bilbies were bred at Charleville. 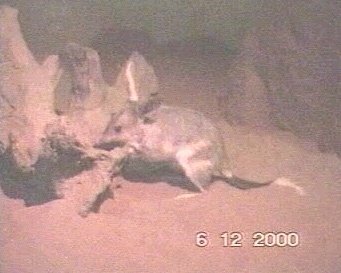 A Bilby grooms itself, investigates the stump, then runs off. Small clip - 258Kb AVI file. Larger clip - 931 Kb AVI file. 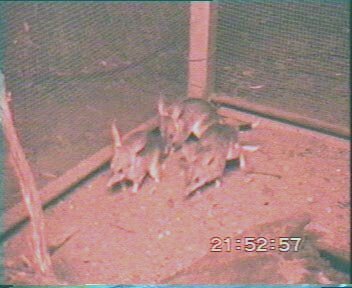 A Bilby sniffs around, checks out the stump, and meets 2 more Bilbies. Small clip - 603Kb AVI file. Larger clip - 2.3Mb AVI file. Note: Depending on the web browser you use, the additional software (plug-ins etc) you have installed, and the settings you use, clicking on the links to the video clips below may either: play the clip in your browser window, play the clip in a new window, ask you to save the clip, or something completely different. Most users of Microsoft Internet Explorer should find the clips play in Windows Media Player, which will open when you click the link. Netscape Navigator users may find the clip opens in the Navigator window - left clicking the page will play the clip, and you will need to use the Back button on your browser to return to this page.